Widsets, Widgets For Your Mobile | OhGizmo! Looks like Nokia is trying to ride the widget gravy train, and it’s calling its initiative Widsets. They’re basically widgets for your mobile. Like its PC and Mac counterparts, Widsets are tiny apps that enable to do all sorts of things, like get weather updates, get your favorite headlines, etc. And it looks like all you need is the following: Java MIDP 2.0, a 128×128 color screen or higher and internet access on your mobile, though WidSets does not currently work with Nextel, T-Mobile USA or BREW-enabled phones (e.g. Verizon, Alltel, U.S. Cellular), or Palm devices. Now, if you’re like me, you’ll start looking for the word Nokia on the Widsets site… and have a hard time finding it. This intrigues me. It is there, though it’s buried in the TOS page. Speculation, anyone? There are few lines in our blog about WidSets and Nokia. To quote: “Few words to hopefully clarify about WidSets and Nokia. 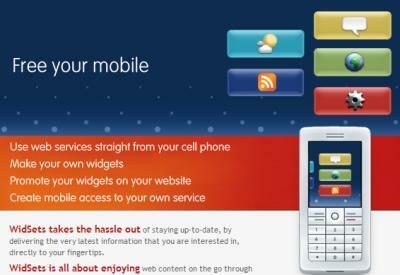 WidSets.com is a venture within the business incubation part of Nokia, Nokia Ventures Organization. At NVO, small teams innovate and create value for Nokia by developing new ideas and concepts beyond the scope of the core Nokia businesses. Welcome all again to participate and make it your service !